12 Days of Christmas Traditions~Starting December 1st! Hello Christmas Friends! Welcome and thanks so much for dropping by. I have been very busy these last couple of weeks, getting ready for my 12 Days of Christmas Series at my Christmas Blog, Keeping the Christmas Spirit Alive, 365! Each day I will be posting about different traditions that we hold dear at this special time of year. I'm so lucky that a couple of surprise guest bloggers will be joining me along the way! I thought it might be nice if we all got to share some traditions and ideas at the same time so each day I will also include a link up gadget so you can share posts on the same theme. On the 12th Day, December 12, I am hosting a linky party where we can share our posts on all things Christmas. December 4 ~ Oh, Christmas Tree! December 5 ~ Father Christmas, Santa Claus or St Nick? 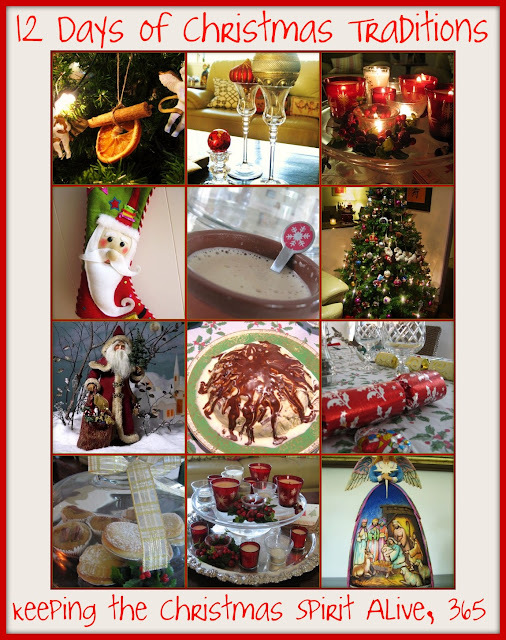 December 8 ~ Christmas Traditions around the world. December 9 ~ Let's Eat:Christmas Foods and Yummy Treats! 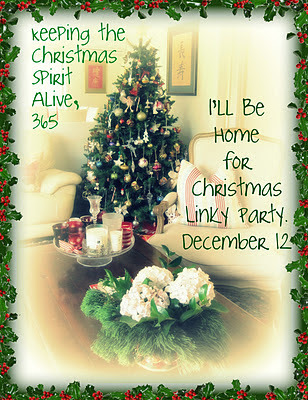 December 12 ~ I'll be home for Christmas Linky Party! You can link up any posts that celebrate Christmas on December 12th. You can share posts about Christmas Crafts, your decorated Christmas home, Christmas recipes, Christmas Songs...anything Christmassy! I sure do hope you will be able to join me each day and that you can link up each day and help me Keep the Christmas Spirit Alive! This sounds like fun . I hope I can participate . Sounds great - I love Christmas. I put some of those reindeer antlers and nose on my car on the weekend. So much fun. Natasha, I'm looking forward to this. Hope to join in on at least a few of these. This sounds like a lot of fun, Natasha! I hope to join in on some! I have something special for Christmas that I hope you will also enjoy ;) Thinking I better get it posted soon! How fun, Natasha! Can't wait to hear about your traditions! I'm looking forward to visiting the Christmas blog each day:) What a fun and festive idea, and the lineup looks great. Best Wishes for a wonderful week ahead. I love your new holiday banner!!! This sounds like lots of fun! great idea. thank you so much for stopping by and inviting me to come over to your blog.....I'll be back! Awesome! I love your Christmas blog so much! You have the best ideas! What a great idea! I'll be back! !